Earn up to 7,960 reward points. Primary hub for digital studios. With this the third redesign of MOTU's flagship interface, the 896mk3 audio interface delivers the advanced design, high-end performance and superb sound that has made it a favorite of audio engineers everywhere. It delivers universal "hybrid" FireWire/USB2 connectivity to your Mac or Windows computer with incredible speed and efficiency. Whether your studio runs over USB2 or FireWire, the 896mk3 is ideal. Thinking of switching over but you're not quite ready? Here's your first step. 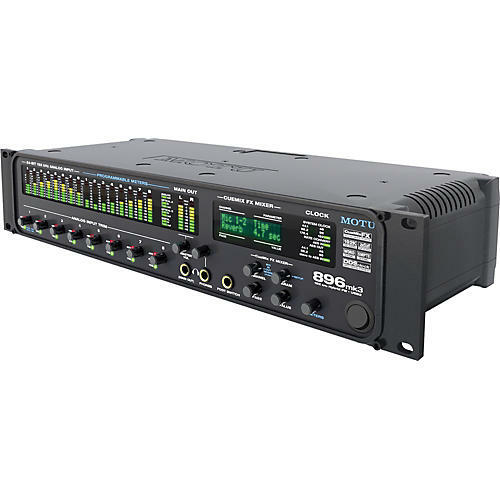 As a hybrid audio interface, the 896mk3 provides flexible connectivity to any Mac or PC via FireWire or high-speed USB 2.0, with eight channels of pristine 24-bit 192 kHz analog recording and playback, combined with sixteen channels of optical digital I/O, stereo AES/EBU, S/PDIF and separate analog main outs. You can even expand your system by connecting the 8pre mic input expander or other MOTU audio interfaces. The 896mk3 is equally well suited for studio and stage, with or without a computer. As an interface or standalone mixer, the 896mk3 provides 28 separate inputs and 32 separate outputs, including dedicated main outs on XLRs and two front panel headphone outs. Connect all of your studio gear, including microphones, guitars, synths, keyboards, drum machines and even effects processors. Record, monitor, route and process all of these live inputs using the professional on-board CueMix FX digital mixer - with no latency and no processor strain on your computer. Apply hardware DSP-driven effects processing to inputs, outputs, and busses independent of your host computer. Add Classic Reverb with lengths up to 60 seconds. Further sculpt your sound with 7-band parametric EQ featuring filter types carefully modeled after British analog console EQs. Choose between two forms of compression: a conventional compressor and the Leveler, an accurate model of the legendary LA-2A optical compressor that provides vintage, musical automatic gain control. When recording from the analog inputs, the 896mk3's signal overload protection gives you an extra 12 dB of headroom above zero with no clipping or harsh artifacts. CueMix FX ” flexible 28 input/16 bus mixer with on-board DSP effects, including reverb with sends/returns, plus EQ and compression on every input and output. Front-panel control ” access any setting in your entire 896mk3 mix directly from the front panel. Lightning fast professional audio. Order today. W x H x D: 19 x 3.5 x 7"